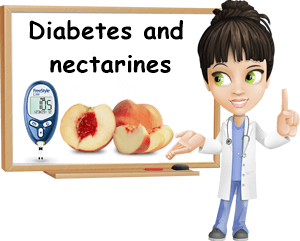 Nectarines and diabetes are a relatively good pair, similar to peaches and diabetes. And that’s because nectarines are a variety of peach, one with a very similar nutritional profile and consequently, very similar effects on blood sugar metabolism. The only condition is that intake be kept low, according to the diabetic patient’s individual nutritional requirements and the restrictions of their condition. The fact that the nectarine also contributes with essential vitamins, minerals and antioxidants to the diabetic diet, despite its modest nutritional profile, further recommends it for consumption, just in limited amounts. The main reason why nectarines are ok for diabetics to eat is because they don’t raise blood sugar levels excessively, when consumed in limited amounts of course. Compared to peaches, nectarine carbohydrate content is only slightly greater, but not much different. 100 g of the raw fruit with skin provides an average of 10.55 g of total carbohydrates of which 7.89 g simple sugars, 0.96 g other digestible carbohydrates that are also become sugar during digestion and 1.7 g indigestible dietary fiber. One small nectarine (estimated weight 130 g) has 13.61 g of total carbohydrates of which 10.18 g simple sugars, another 1.23 g digestible carbohydrates that are also broken down into sugar following digestion and 2.2 g indigestible dietary fiber. One medium nectarine (estimated weight 142 g) has 14.98 g of total carbohydrates of which 11.20 g simple sugars, a further 1.38 g digestible carbohydrates that become sugar after digestion and 2.4 g indigestible dietary fiber. You can say nectarines have an overall moderate sugar content (7.89 g in 100 g of fruit, compared to 8.39 g in peaches. After all, they are virtually the same fruit, except for the fuzz on the skin which is absent in nectarines. And yes, eating them does make blood sugar levels go up, but not excessively. So long as you consume the fruit in moderation, meaning small amounts at once, nectarines are not actually that bad for diabetes. But it’s not just the sugar content of fruits that matters – other digestible carbohydrates also get broken down into sugar during digestion and contribute to blood sugar levels just as much. So when you are looking to determine whether a fruit is good or bad for you if you have diabetes or how much of it you can eat, look at the entire carbohydrate content. In nectarines, you have about 1 g of other digestible carbohydrates that also contributes towards your daily intake. Fiber, which is also a carbohydrate, is indigestible and doesn’t get absorbed so it doesn’t contribute to blood sugar levels. Instead, it slows down digestion and the rate of sugar absorption into the bloodstream, contributing to a steadier rise which is a good thing if you have diabetes. You get over 2 g of fiber in a small and moderate nectarine, but most of it is in the skin of the fruit so make sure you eat the fruit whole if you want to get all the benefits it has to offer. The glycemic index (GI) measures how fast the carbohydrates in a plant food raise blood sugar levels. Below 55 is a low GI. Between 55-69 is a moderate GI. Between 70-100 is a high GI. The lower the glycemic index, the steadier the rise in blood sugar levels and the less likely the fluctuations. By choosing foods with a GI as low as possible, there is also a reduced risk of diabetes complications over time due to better management of blood sugar levels. Nectarine glycemic index is around 40 (low), which recommends the fruit for consumption with diabetes, in reasonable amounts. Of course, not all diabetics will have an identical glycemic response and some may feel better than others after eating the same amount of the fruit. If you feel sick or unwell after eating nectarines or other fruit, you can either reduce your intake or discontinue consumption altogether. Just because other people with diabetes can eat a certain fruit and it’s good for them, that doesn’t automatically mean you can eat it too or that it’s good for you as well. How many nectarines can diabetics eat? Serving sizes as low as 100 g of the fruit or one small or one medium nectarine (estimated weight: 130-142 g) are believed to be well tolerated by most people with diabetes type 2 and 1, usually no more than one serving a day. But it’s better to see your doctor or a dietitian with experience in diabetic diets and receive a personalized eating plan tailored to your individual nutritional requirements that includes a recommended intake of carbohydrates per day and per meal. There isn’t really one recommendation to suit all people with diabetes, but nectarine serving size is best kept low and it’s determined by multiple factors: the diabetic patient’s individual nutritional requirements based on current weight, height, age, level of physical activity and the restrictions of their condition (some may need to lose weight, some more than others), medication, tolerance to sugar in food, glycemic response etc. 1) Small servings of the likes of 100 g or one small or moderate fruit (estimated weight of 130-142 g). 3) Split your intake over the course of an entire day. Example: half a fruit now and half later in the day. 4) Eat separate from other fruits. More fruits at once means more carbs and a higher glycemic response. 5) Never on an empty stomach. Always after a meal. Or else it will make your blood sugar go up fast. 6) Best after a light protein, low carbohydrate meal. 7) Pair with sources of animal protein or fat. Both protein and fat take longer to digest and will slow down the digestion of carbohydrates as well, reducing the likelihood of blood sugar fluctuations. 8) Eat the fruit whole, with skin, to get all the fiber. 9) Less ripe fruits have less of an effect on blood sugar. But may cause diarrhea or stomach pain. 10) Exercise after having fruit to further reduce effects on blood sugar metabolism. Nutritionally speaking, nectarines are very similar to peaches and provide small amounts of vitamins A, C, E and K, B1, B2, B3, B5, B6 and B9, calcium, iron, magnesium, manganese, phosphorus, potassium and zinc. They have only 1 g of protein per 100 g, less than 0.4 g of fat and only 44 kcal. Overall, they provide minor benefits for general health, do not promote weight gain and may encourage weight loss. You can eat nectarines with diabetes type 2 and type 1 so long as you only have small amounts at once and not exceed your carbohydrate intake per day and per meal. Remember the fruit is sweet and brings a significant contribution to your daily intake. It’s preferable to eat the fruit whole, with skin, and always after a meal. Pair with chicken, yogurt, a little cheese or butter to reduce its glycemic index even further. And remember, like most fruits, nectarines are only bad for diabetics when consumed in excessive amounts.